Priory students get to be news anchors for national tv! Beth and Alex were chosen by the news crew from BBC National and BBC South Today to have the role of news anchors for the filming of the 1330 and 1830 news today! Below is a clip from the tv earlier, apologies for the current poor quality but the official tv package will be with us shortly. In the mean time, here are some images from the day of our girls. They were incredibly professional and calm, and outside sources stated that all Priory pupils were the best behaved, most creative, and most productive students taking part in BBC School Report and Kidsmeet today. So big well done to you all, you are amazing. Today Priory school took part in a project called Kidsmeet. 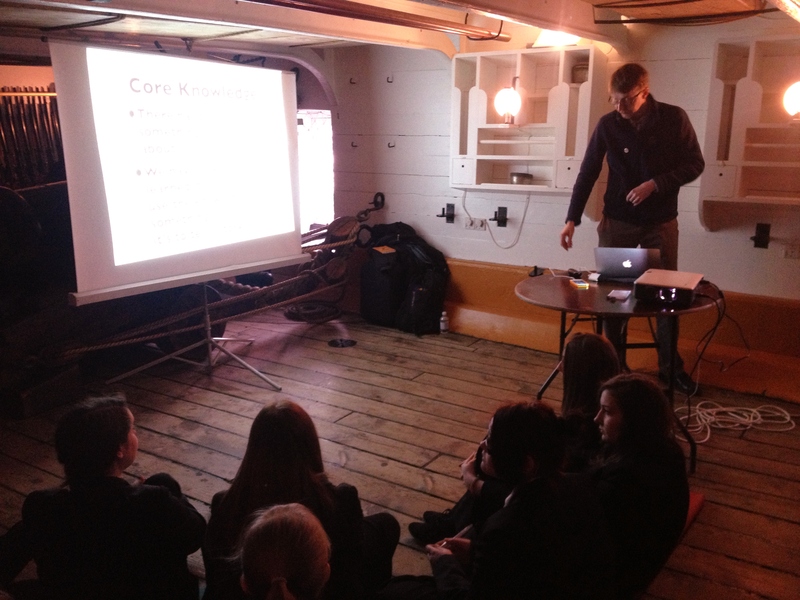 Ten pupils were chosen from each of five different schools to take part in the first south coast Kidsmeet, it was located on HMS Warrior. Kidsmeet gives the opportunity for us pupils to express our views on the curriculum. It is a chance to share our ideas, and for kids to teach the teachers. We started off by brainstorming our ideas on paper and came up with a final idea of how we would like to change the curriculum. We decided we would like to use technology to create a new curriculum with relevant time topics whilst using pupils that are knowledgeable in the topics (“student experts”) to link them. We feel that if we were learning about volcanoes in geography, other subjects should teach about it as well therefore linking them all together. Technology is also a big part to the curriculum and should be used in subjects across the school. This would meet Article 17 of the Unicef Rights of the Child which states we have the right to access information from the mass media. At Kidsmeet, we questioned other schools about their use of technology in their school. 100% of pupils we interviewed only had the use of technology in IT classes, and the phone policy banned the use of mobiles. At Priory we are more unique and we encourage the use of technology by having a phone policy that allows use of our own devices. We feel it is a good use of access to research and contact with others. We also feel other schools should have this opportunity and we shared our views at Kidsmeet. Construction started on July 31st 2006 and the ship was launched on October 21st 2009. 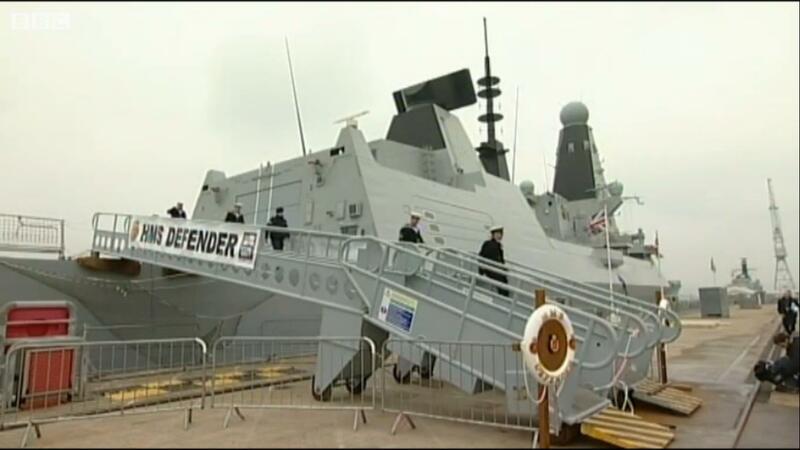 Finally today, on the 21st March 2013 the HMS Defender is being commissioned in front of a large audience including the Duke of York. The mighty ship is the fifth type 45, or ‘D’ class of air defence destroyer, built for the Royal Navy. She is one of a fleet of the largest battleships ever built. She is the eighth ship to bear the name and her sister ship the HMS Dragon set off yesterday for her first tour of duty to the Middle East. We hope the ship & all who sail on her will have many safe sailings to come! This is a summary of the kidsmeet project today. At Kidsmeet students got to be the teacher, and help create new learning activities. We discussed the changes with the new curriculum for Geography. Michael Gove , the head of education has not heard the point of view of the pupils, the people who are actually learning. And this seems strange to us. From his own point of view and his colleagues they think that children should learn the old fashion way of remembering facts off by heart but pupils beg to differ and would love to have a new curriculum, a unique brand new curriculum. We believe we need a more innovative and interactive style, as that will bring the kinds of skills we will need in our future. According to Article 13 of the UNICEF rights of the child, children are aloud to say their point of view so at kidsmeet a group of children got to have their say of what they would like to learn. For myself, in conclusion in geography, pupils can get to learn about more countries and their cultures, expand their global awareness of Africa, south and east Asia and Russia, and much more. And we think our experiences can be improved through using the help and aid of technology. The Mary Rose is a historical ship which was built in 1509 and served the mighty King Henry VIII. The ship was lost in a battle between France and England in 1545 and it wasn’t until 1982 that the boat was raised from the deep blue ocean. Finally, 31 years later, the Mary Rose is going on show to the public through a lovely modern museum! The museum, designed by Wilkinson Eyre and Pringle Brandon, is opening on 14th April 2013 in the Historic Dockyards. The museum was scheduled to open last year and we’re hoping that the delay is worth the wait! The delays were partly caused by construction issues, especially getting the perfect casings to protect all the important historical artefacts. But the new museum will allow the public up close and to feel like you are almost walking on board the ship. Here at Priory, we’re excited to see how the magnificent ship has survived and to see the mysteries in the new museum. Most of us have one in our pocket, and some people say they rule our lives. I am of course talking about mobile devices. But, should children be allowed to use them in schools? We went to find out. According to The Guardian, the Union Chief has said “Pupils should reap the benefits of technology and not be punished for using it” – surely this means we should be encouraged to use mobile devices safely? That’s what the Unicef rights of the child say too. Although we know there can be problems sometimes, it’s said that “They have lots of access to information so they would be really useful in class” says Miss Lowry. And it’s not often you see someone in school using their phone wrongly. Not as often as seeing someone doodle or throw paper anyway! Many teachers across the country are for having mobile devices in schools yet some people are still scared, but you never know, in the future phones could be a very common sight in schools across the UK. Today was the announcement of the new budget, something that can have implications for all of us. The government wants to build 10.000 more homes to create more jobs and they need to be affordable. The BCC said they think the government should stick to the plans to cut borrowing money. And it will cost over £30bn. In good news, fuel costs aren’t going up. Although budget cuts are occurring across many areas, the Chancellor has promised to protect the NHS and education – phew! A nine year old girl has had a terrifying prehistoric beast named after her since discovering the new species a fossil hunt. Daisy Morris, from the Isle of Wight, stumbled upon the remains in a cliff face four years ago when she was a mere four years old . The species has been named Vectidraco Dasiymorrisae in her honour. Daisy and her parents took the rarity to the Southampton University to present it to fossil-guru Mr Simpson. The species has now been verified as unique and is receiving attention in scientific papers. Furthermore, the fossil is going on show at the Natural History Museum in London. 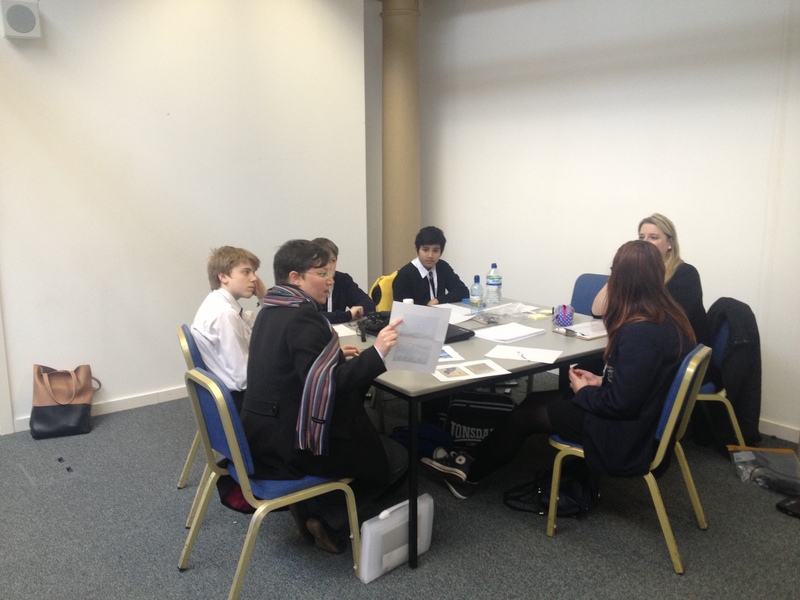 Priory Pupils celebrate World Poetry Day with Portsmouth Poet Laureate. A group of year 8 students were lucky enough to celebrate World Poetry Day with Portsmouth’s Poet Laureate, Sam Cox. 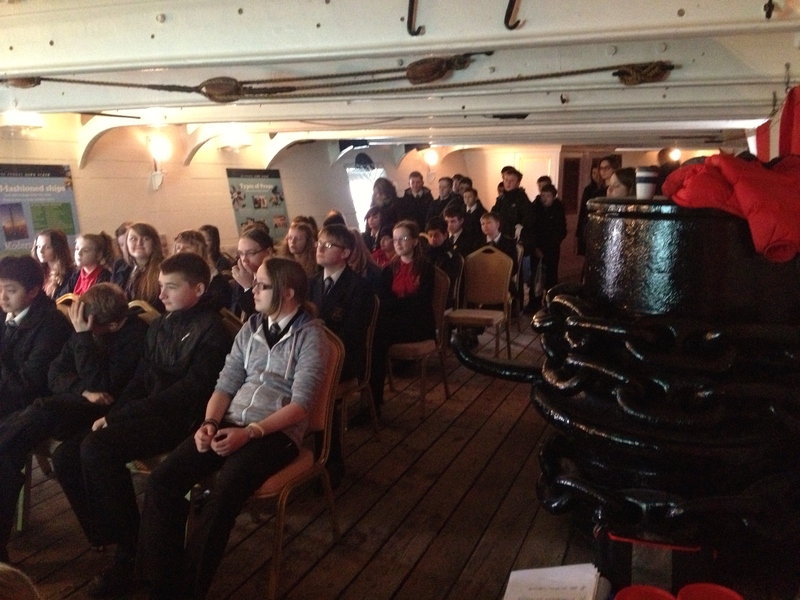 The students were treated to a tour of the Historic Dockyard, including the chance to go on HMS Warrior and Victory, to gather ideas for a poetry workshop. Everyone involved had a fantastic time and it was a wonderful way to enjoy World Poetry Day.ms for each of the exhibitions at the Historic Dockyard and then announced the exciting news that their fantastic poems will be displayed on the Historic Dockyard website. Penguin models wetsuit at local zoo. A penguin at Marwell Zoological Park has started wearing a specially made wetsuit to keep him warm. Unfortunately, the penguin named Ralph, lost all his feathers as a chick and now needs to wear a wetsuit in place of his feathers. Usually penguins lose and regrow their feathers annually. 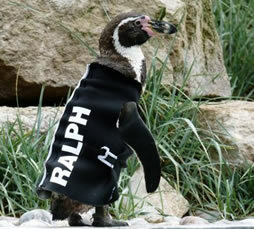 However, Ralph needs a wetsuit to protect him from the sun and to keep him warm in the evenings. Visitors to Marwell can see Ralph modelling his wetsuit and may soon see him wearing a snorkel and mask, because the zoo hope Ralph can become the country’s first scuber diving penguin. Oscar nominated costumes from ‘Les Miserables’ on display in Portsmouth. Following international block busting success of the hit musical ‘Les Miserables’. Portsmouth Historic Dockyard is hosting a selection of the costumes from the musical, including clothes worn by Oscar nominated Anne Hathaway as Fantine, Amanda Seyfried as Cossette and many more from the hit film. The costumes are on display in the UK for the first time and we were lucky enough to interview Jackie Shaw, the events manager from Portsmouth Historic Dockyard, to learn more about the exhibition. Jackie explained that the exhibition is not only a treat for film lovers but also for people who want to learn more about clothing from a different period in history. The team at the Historic Dockyard are hoping that the display will attract a new group of visitors to Portsmouth. The exhilarating experience will be running at the Historic Dockyard until April 2013. By Alex, Beth and Mia. So, here we are at Action Stations and it’s all kicking off! Today is a bit chaotic as there is so much going on for BBC School Report! 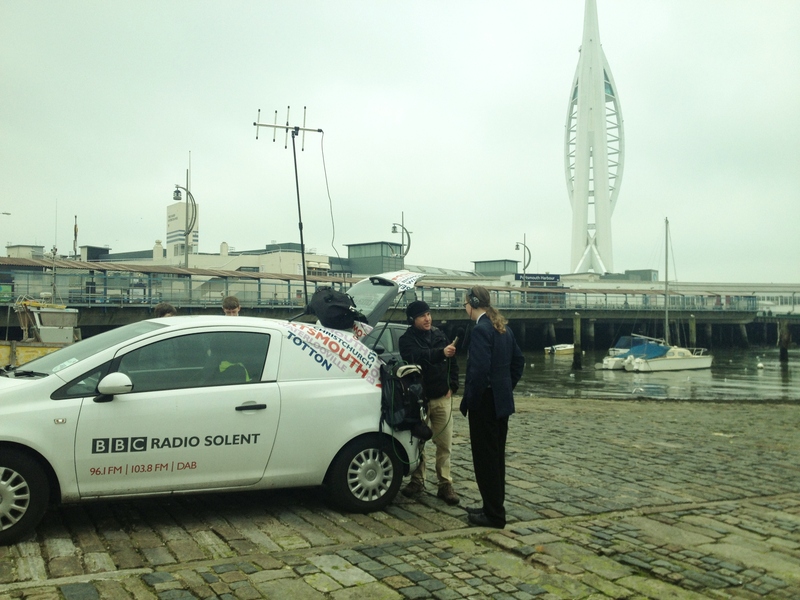 Already today, Priory school’s Robbie got interviewed live on BBC Radio Solent about the use of technology in learning! Click HERE to listen to the broadcast live – and on his birthday too! For the rest of the day we will be splitting forces to work on HMS Warrior and Action Stations. Check back throughout the day for live blogging. And good luck everyone! The official page of Priory’s 2013 BBC School Report adventure! Check back here on 21st March by 4pm to see all our hard work! 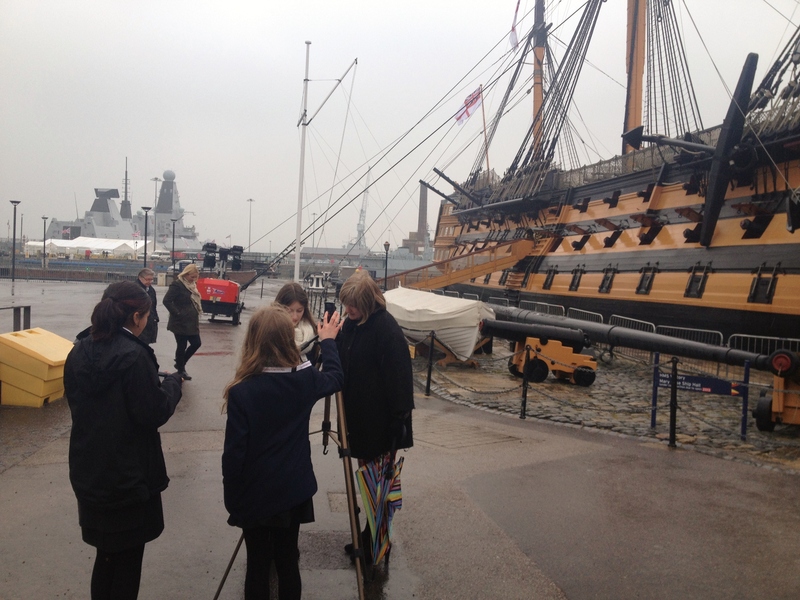 – World Poetry Day 2013 : students create a poetry orienteering game around the Historic Dockyard. Poems created by our students and local poets will be displayed at exhibits around the dockyard with QR codes linking them to create a permanent record of our work. – London 2012 : is there an Olympic legacy or is it a myth? – TeachMeet Pompey : what happens when kids take over and teach the teachers? If you are in Year8 and would like to take part in school report then see Ms Debens or email jdebens@priory.portsmouth.sch.uk. Or if you are in Year7,8 or 9 and want to take part in ‘kidsmeet’ and create new lessons & activities around the dockyard using tech then also get in touch. Thank you to those who sent ‘shout outs’ to the BBC News School Report shout out wall today, it’s great to see that you value the work everyone did today. Credit to Edwin’s mum for this! Thank you! Today, Cameron and Hermione were lucky enough to go with Mr Atkins to the London Olympics site to meet Lord Sebastian Coe. They were selected as one of only 15 schools across the country that was invited. Lord Coe faced interrogation on a range of questions ranging from access to tickets, the sustainability of the Olympics, the Paralympic games, and why netball is not an Olympics sport. Cameron and Hermione were chosen to take part in radio interviews and the School Report live video stream, where they were privileged to closed the show off for this year. Part of the Lord Coe interview is shown here http://www.bbc.co.uk/news/uk-politics-17390776 although our part of this interview was part of the live broadcast and not on the recorded website unfortunately. Still, what a great day!